When it comes to content, this is the case of quality over quantity. A lot of content doesn’t mean your content strategy is successful. This is why keeping your content relevant and up-to-date is crucial. Content Audit feature is essential for this. First, it provides you with an overview of the most important content metrics: user behaviour metrics (number of sessions, session duration, and bounce rate), social impact (number of shares across major social networks) and websites linking to your content. Besides this, it also helps highlight issues that prevent your content from being visible in search engines. It’s always a challenge to track how your content is performing on external sources. But with SEMrush Post Tracking things are becoming easier. We provide you with all the metrics you need to evaluate your content’s results on other websites. Assess the social impact: the number of shares your article got on Facebook, Twitter, Google+ and LinkedIn. Then dig deeper and see how the number of shares changed over time. 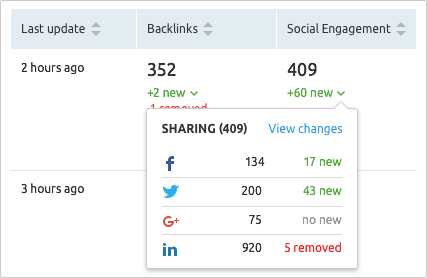 Then you’ll be able to track all the backlinks that your articles have acquired - we’ll help you assess both the quantity and quality of these links, providing you with a trust score and a page score for each backlink. Finally, we’ll show you how well (and if at all) the article is attracting traffic from search engines by finding all the keywords your article is being indexed for in Google Top 100. 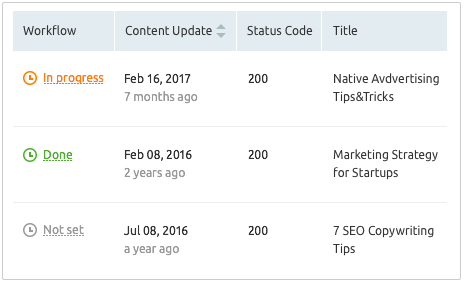 Want to quickly discover which article got better results? Need to pinpoint the most successful author? Or perhaps you need to know which of your external sources did the best job? Use the Content Analyzer to find it out. See how different articles, authors or websites compare against each other. Create customized URL groups for an even deeper analysis. Based on the results of such comparison, you’ll have enough data to decide which source, topic or author to focus on.